I have been remiss in posting, I admit, but I plead cons, editing, and revision of Book 2 in the "Fate's Arrow" series I just sold to Sky Warrior Books. Plus, I'm on vacation, wallowing in words and actually grateful for the pouring rain that has put the kibosh on all the outside projects I had planned to catch up on. To make up for abandoning you all, I am oh so pleased to present another guest blogger and horse authority today, Darragh Metzger. In her own words, Darragh makes her living in the world's two lowest-paying professions: acting and writing. While her resume includes stage and screen credits, she's spent the last several years wearing armor, riding horses, and swinging swords with The Seattle Knights. Get that? Knights. Jousting. Hands-on experience with a lance in her hand. I can't say I'm any kind of expert on the ancient and noble sport of jousting. Okay, yes, I spent about ten years jousting in a professional capacity, but strictly as a performer, not competitively. There's a good reason for that. I decided at an early age that I wanted to live, and I also decided that I'd prefer to live independent of wheelchairs and machines designed to force-feed me or keep me breathing. And I like my teeth. Such a wide variety of forms and equipment were in fashion at various times in various parts of the world that most fantasy films that depict jousting get at least something right. No one would refer to the Heath Ledger movie "A Knight's Tale" as historical by any means, but it did pretty well at depicting what jousting was all about and the frenzy it generated in the popular imagination. The mini-series version of "Game of Thrones" has a quite spectacular jousting scene, which includes the death of one of the competitors as well as a taste of some of the pageantry and spectacle that was very much a part of the actual sport. And the classic film "Ivanhoe" has a great formal duel between Bois-Guilbert and Ivanhoe, even with the obviously rubber weapons. As for fantasy novels, few go into sufficient nit-picking detail to display flaming gaffs. We won’t even mention those recent reality shows featuring jousting. They weren’t seriously trying to be authentic anyway. 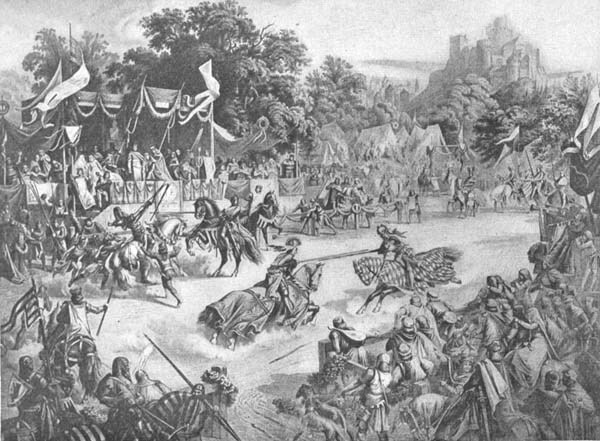 A lot of the technique of jousting is dependent upon the equipment. If your hero/heroine is wearing maille and a Great or Barrel helm, s/he is probably going to be jousting in one of the Frankish styles, which means using a lance and shield. Most of the other styles require some form of plate armor. Very possibly, s/he will be "free-jousting", which means without the use of a barrier between his/her horse and the opponent's. If, on the other hand, s/he's in the equivalent of full gothic plate in the late medieval or renaissance style, you're going to have a lot more variables to deal with. For one thing, instead of a spear and shield, you'll have a "heavy" lance with a blunted tip or a coronal, possibly rigged to blow apart (if this is in a tournament, not a duel). Yes, surprise: knights sometimes cheated in order to win. Take it as a given that most knights were better riders than any of us will ever be, even in our most fervent imaginations. They generally started younger, did it a lot more often, and their lives depended on it. If you're writing about a culture that corresponds to our medieval or renaissance eras, the same rules apply. Your hero/heroine has superb balance even in full armor and helm, can steer a horse with just weight shifts and simple leg aids, handle a lance and shield on a galloping horse without accidental mis-cues, and can, while fully armored, leap onto his charger from the ground without assistance. I'm going to interrupt myself right now to address the single biggest beef I have with the way I too often see warhorses and jousting depicted in movies and novels: KNIGHTS DIDN’T RIDE DRAFT HORSES. Draft horses as we know them today didn’t even exist. The average warhorse was about 14.3 hands, and a lot of them were smaller. A horse 15.2 hands – average-sized by today’s standards – was considered large. It was a big deal when the Spanish bred Andalusians that reached 16 hands in the late 1500’s. I originally wrote a long paragraph to prove my point, but I'll skip that; if you're curious, I'll send it to you. But what was true then is true now: unless your horse is a trained warhorse with actual jousting experience, the chances of being able to successfully get down the list are about 1 in 10. Most horses will turn and run when they see another horse charging at them. Younger horses will almost always yield to older ones. How do they know? They just do. It's a horse thing. As I say, only about 1 horse in 10 can become a jousting horse. But even those with the right mind and disposition for it require training and a great deal of practice before they can charge down the list at another horse and hold their ground. I've had other jousters tell me that mares will always yield to a stallion. This is, as far as I can tell, what may be politely referred to as "a load of crap." Which horse yields to which depends entirely upon the individual horse. Just as with race horses, jousting horses can learn how to out-bluff one another, and the tricks to make the other horses flinch or veer so their riders miss. Smaller horses learn when to brace themselves for impact against bigger horses. Faster horses learn when to pour on the speed and when to reserve it. Of the horses that become successful jousting horses, some get competitive about it; others are just doing their jobs and could care less; still others honestly love it and enjoy "playing the game." And by the way, if your stallion is sufficiently well-trained, he should ignore a mare, even one in heat, while under saddle. He has a job to do, and he knows it. Work now; play later. Mares are the same way (and there are mares who are just as difficult to handle when in heat as any stallion), though how much her hormones affect her work ethic and concentration is entirely dependent upon the individual. Up until good ol’ Henry VIII’s time, winning at the joust did not really require size or physical strength; skill, aim, speed, and superior horsemanship were far more important. There is plenty of documentation to prove that women did, in fact, sometimes participate, most often (though not always) disguised as men. Male jousters hated this, and protested it vociferously, but it did happen. That being said, all things being equal, the heavier opponent has a better chance of staying in the saddle. That’s just physics. I've jousted with lance (a 10-to-12' hickory or oak pole with a rounded tip) and shield, and with just a "heavy" lance (false tipped balsa or foam),as well as the massive, carved wooden lances that weigh 15 lbs or so which are used by some jousting troupes for competition jousting. All of these hit with a lot of impact, even the false-tipped ones, and armor doesn't keep you from feeling it, just from getting hurt. At least, that's the theory. I've had bruises, dislocated ribs, bloody lips, and broken fingers that told a different story. The horse's weight and speed add a LOT of "oomph" to a blow. Historically, death in the joust was not all that unusual; broken necks or splinters through the eye slits happened all the time. It just occurred to me that someone might want to write a modern story with jousting, such as in a renfaire or something. In which case, anything goes. I have yet to see a joust troupe in the U.S. that is actually 100% historical, although there are some that try, and some that do a pretty good job of at least getting the flavor. Because I’m a bit obsessed with horses (gee, can you tell? ), I tend to write jousting scenes with a heavy emphasis on the horses and how their performance affects the outcome. But, truthfully, a better approach would probably be to treat a jousting scene as you would any other action scene: remember that too much detail tends to slow the action. Brevity, lots of active verbs, short sentences, and sketchy but telling details speed it up and add tension and excitement. For an excellent overview of the development of the horse, especially medieval war horses, I recommend The Royal Horse of Europe by Lady Sylvia Loch and The Conquerors by Deb Bennett, Phd. For reference works that deal with jousting, you can't go wrong with The Medieval Warhorse From Byzantium to the Crusades by Ann Hyland, and, first and foremost: The Royal Book of Horsemanship, Jousting, and Knightly Combat, by Dom Duarte (the King of Portugal in 1438). Thank you, Darragh! It is always a pleasure to hear from someone who's been there and done that. Darragh is a fellow writer whose publishing credits include plays, novels, non-fiction articles, and short stories, one of which made The StorySouth Millions Writers Award Notable Stories of 2005. She has written seven novels and two short story collections, all of which are available from TFA Press. 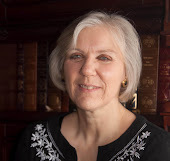 She is working on the last book of THE TRIADS OF TIR NA N'OG series and a non-fiction project. If she had free time, she'd spend it with horses. She is married to artist/fight director Dameon Willich. This is great! Thanks to both Sue and Darragh for the information. When I rode drill team patterns, it was definitely tough to get the horses to ride straight at each other at speed (we'd do several variations of this, either straight or in an X pattern, riding between the horses going the other direction). Heh. Way back in the way back when I rode with the Lilac Patrol drill team here in Spokane, the four flag girls did a couple of short routines while the rest of the team got a chance to rest their horses for a minute or two in the middle of the drill. One involved a nose-to-tail X cross-through that never failed to draw gasps from the crowd when we did it right. I do recall some spectacular spring practices when the new members were learning the drill. The full cross-through sometimes saw some interesting near-wrecks, and I remember some balky beasts among the flag horses until they got used to the idea and learned to listen to their riders. Bad timing in a rider was not a good thing! Horses are smarter (and dumber) than we expect sometimes.